Subject: Payment of interest and maturity value of Small Savings Instruments through Savings Account. (i) Accounts for the purpose of crediting interest/maturity value of all accounts of all Small Savings Instruments [except existing Post Office Savings Account (POSA)] and Small Savings accounts already linked to POSAS as on 31.7.2017 shall be opened automatically as Basic Savings Account (zero balance account) with Specific coding “Interest and maturity value of Small Savings Instruments”. However, only one basic savings account shall be opened for one person and it shall be linked with CIF or/and Aadhaar. These are not normal POSA accounts, as these can be opened on zero balance for purposes such as MGNREGS etc. Interest on these accounts with this coding will be paid at POSA rates. 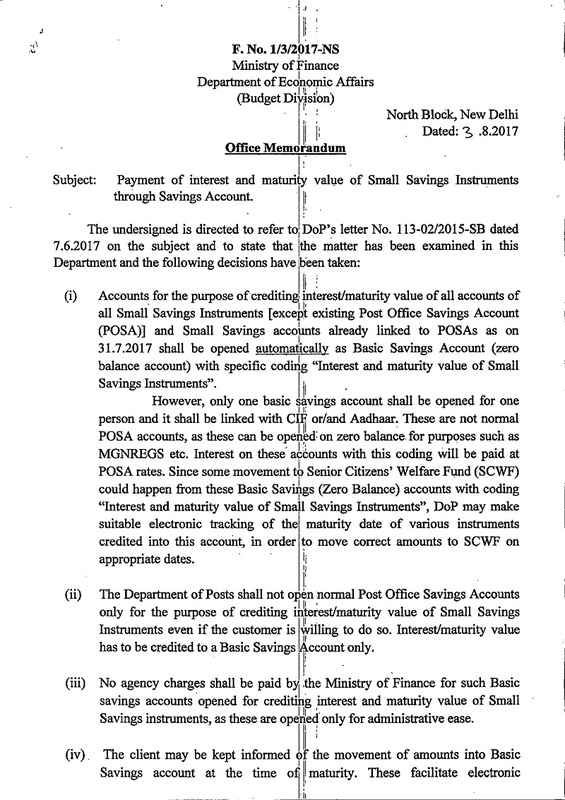 Since some movement to Senior Citizens’ Welfare Fund (SCWF) could happen from these Basic Savings (Zero Balance) accounts with coding “Interest and maturity value of Small Savings Instruments”, DoP may make suitable electronic tracking of the maturity date of various instruments credited into this account, in order to move correct amounts to SCWF on appropriate dates. (ii) The Department of Posts shall not open normal Post Office Savings Accounts only for the purpose of crediting interest/maturity value of Small Savings Instruments even if the customer is willing to do so. Interest/maturity value has to be credited to a Basic Savings Account only. (iii) No agency charges shall be paid by the Ministry of Finance for such Basic savings accounts “opened for crediting interest and maturity value of Small Savings instruments, as these are opened only for administrative ease. (iv) The client may be kept informed of the movement of amounts into Basic Savings account at the time of maturity. These facilitate electronic transactions and discourage cash transactions. The client can withdraw the amount through ATM cards and need not approach the office for withdrawal. 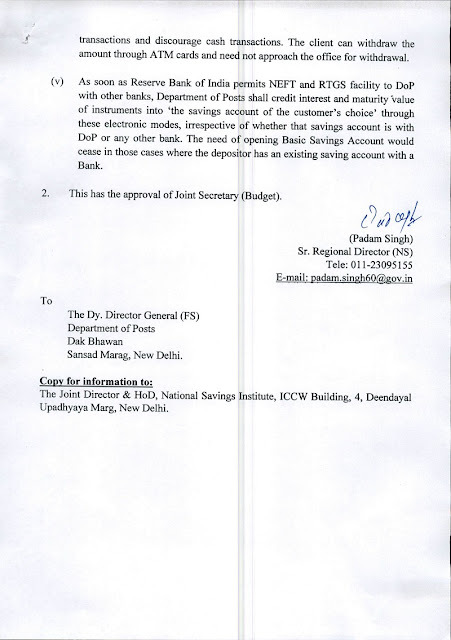 (v) As soon as Reserve Bank of India permits NEFT and RTGS facility to DoP with other banks, Department of Posts shall credit interest and maturity value of instruments into ‘the savings account of the customer’s choice’ through these electronic modes, irrespective of whether that savings account is with DoP or any other bank. The need of opening Basic Savings Account would cease in those cases where the depositor has an existing saving account with a Bank. 2. This has the approval of Joint Secretary (Budget).